Born: January 14, 1914, Lathrop, Clinton County, Missouri. Married: June 15, 1940, Kansas City, Wyandotte County, Kansas. Died: August 17, 2004, Wakefield, Clay County, Kansas. The daughter of Charles and Ada (Blackwood) Bowles, Hazel Bowles was born January 14, 1914, in Lathrop, Missouri, and grew up in Junction City. She attended Park College in Kansas City, Missouri, and graduated from Northeast Missouri State Teachers College in Kirksville, Missouri. She taught music in Wakefield, Clay County, Kansas, where she met William Avery. They were married June 15, 1940 in Kansas City, Kansas. The Averys lived in the Washington, D.C., area while he served five terms in the U.S. Congress, from 1955 to 1965. 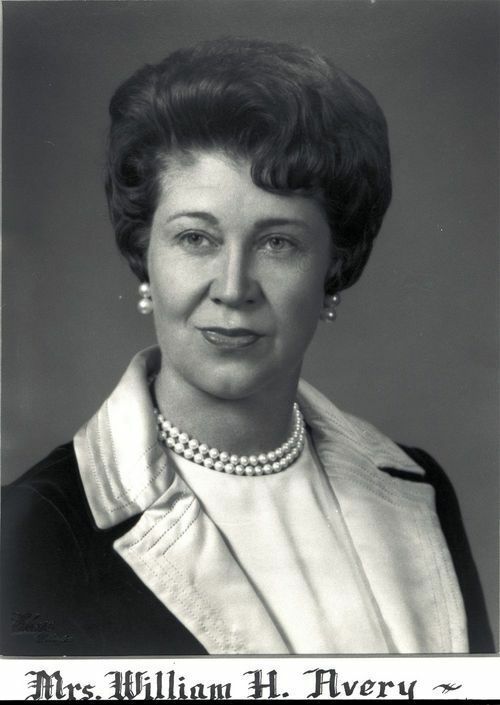 After he was elected as the 37th governor of Kansas, they lived in Topeka and she became First Lady, serving from 1965 to 1967. During that time she undertook direction of the first remodeling of Cedar Crest, the governor's residence, and she organized the annual Easter egg hunt. They lived in Wichita before returning to Bethesda, Maryland, where he worked for the U.S. Department of the Interior. After his retirement, they returned to Wakefield. They had two sons, William and Brad, and two daughters, Barbara and Sue. She died August 17, 2004, in Wakefield, Kansas.